Here’s a group of four recent papers that are worth checking out but I don’t have the time to cover. The first provides a set of tools for neuronal circuit tracing. The second pushes super-resolution imaging into fast, live-cell imaging. The third, by a friend from graduate school, uses G-CaMP to make strong claims about olfactory coding in fruit flies. The last reports remarkable data pointing to the distributed nature of conscious perception in humans, which would have been a great data set to reference in my recent talk on free will. We developed retrograde, transsynaptic pseudorabies viruses (PRVs) with genetically encoded activity sensors that optically report the activity of connected neurons among spatially intermingled neurons in the brain. Next we engineered PRVs to express two differentially colored fluorescent proteins in a time-shifted manner to define a time period early after infection to investigate neural activity. Finally we used multiple-colored PRVs to differentiate and dissect the complex architecture of brain regions. Structured-illumination microscopy can double the resolution of the widefield fluorescence microscope but has previously been too slow for dynamic live imaging. Here we demonstrate a high-speed structured-illumination microscope that is capable of 100-nm resolution at frame rates up to 11 Hz for several hundred time points. We demonstrate the microscope by video imaging of tubulin and kinesin dynamics in living Drosophila melanogaster S2 cells in the total internal reflection mode. Select Drosophila glomeruli mediate innate olfactory attraction and aversion. Fruitflies show robust attraction to food odours, which usually excite several glomeruli. To understand how the representation of such odours leads to behaviour, we used genetic tools to dissect the contribution of each activated glomerulus. Apple cider vinegar triggers robust innate attraction at a relatively low concentration, which activates six glomeruli. By silencing individual glomeruli, here we show that the absence of activity in two glomeruli, DM1 and VA2, markedly reduces attraction. Conversely, when each of these two glomeruli was selectively activated, flies showed as robust an attraction to vinegar as wild-type flies. Notably, a higher concentration of vinegar excites an additional glomerulus and is less attractive to flies. We show that activation of the extra glomerulus is necessary and sufficient to mediate the behavioural switch. Together, these results indicate that individual glomeruli, rather than the entire pattern of active glomeruli, mediate innate behavioural output. Parietal and premotor cortex regions are serious contenders for bringing motor intentions and motor responses into awareness. We used electrical stimulation in seven patients undergoing awake brain surgery. Stimulating the right inferior parietal regions triggered a strong intention and desire to move the contralateral hand, arm, or foot, whereas stimulating the left inferior parietal region provoked the intention to move the lips and to talk. When stimulation intensity was increased in parietal areas, participants believed they had really performed these movements, although no electromyographic activity was detected. Stimulation of the premotor region triggered overt mouth and contralateral limb movements. Yet, patients firmly denied that they had moved. Conscious intention and motor awareness thus arise from increased parietal activity before movement execution. I’ll be the first to admit that my limited focus area in neuroscience, the levels of molecules and cells, biases me to attend to the trees, while missing the patterns in the whole forest. Many of our best recording and imaging methods, single-unit electrophysiology, fluorescence imaging and multi-unit extracellular arrays give us access to only a very tiny piece of the brain at any given moment. Yet endogenous neural activity is dependent on powerful (and subtle) interactions between geographically distant regions of the brain. Whole-brain measurement techniques, such as functional magnetic resonance imaging, magnetoencephalography, and diffusion tensor imgaging, can measure these interactions, but tend to have poor temporal-spatial resolution. Therefore, in order to understand the gestalt of the brain, it is useful to examine models that integrate our knowledge of single cell morphology and activity patterns, local circuitry, and distant connectivity. The complexity of any brain model is limited by the computational power available. With 10^11 neurons and 10^15 synapses in the brain, each with a wide degree of possible synaptic strength, the computational power required to precisely model the entire brain is currently unavailable (though the Blue Brain project is trying). But maybe we don’t need every neuron. Maybe we can cull this 10^11 number down to something more manageable, a million, that proportionally represent a large number of the neuronal classes of the cortex. 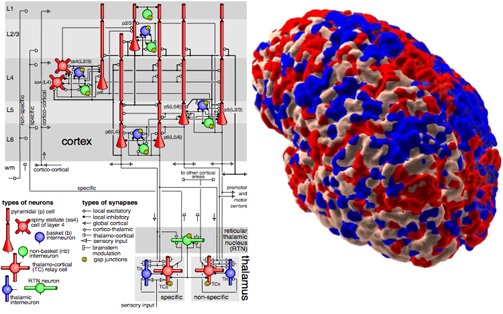 In this PNAS paper, Large-scale model of mammalian thalamocortical systems by Eugene Izhikevich and (Nobel laureate) Gerald Edelman, they demonstrate that many endogenous-like patterns of brain activity spontaneous emerge from just this sort of reduced model. The model reduces the neuron count, leaves out many deep brain structures, and simplifies spike generation, but leaves intact important long-range connections, cellular morphology, dendritic spike initiation, synaptic plasticity and learning rules and dopaminergic modulation. With a sufficient ‘priming of the pump’ by allowing random miniPSPs to percolate through the network, the wiring organizes itself such that spontaneous activity patterns (delta, beta and gamma oscillations, wave propagation, anticorrelated clustering) emerge that are reminescent of in vivo patterns of activity. They also show the system is chaotic; a single spike added or subtracted evolves a totally different activity pattern after half a second, evoking the specter of determinism and the illusion of free will. These are still early days, as they have not integrated any sensory input into the system and leave out many important brain structures. Nor do they make any testable predictions with the model. Nevertheless, the model appears to be readily extensible, and as greater understanding of brain regions and greater computing power become available, the power of the model may dramatically increase. For now, this paper is a tantalizing reminder of why many of us were originally attracted to the study of neuroscience, the quest to understand how our brain’s activity creates consciousness, and a context in which to place the little trees we struggle to understand. Props to Neurochannels for the link.